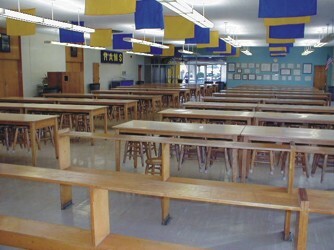 A Fast Food restaurant look in a room that previously looked like a science lab- complete with stools for the students to use. 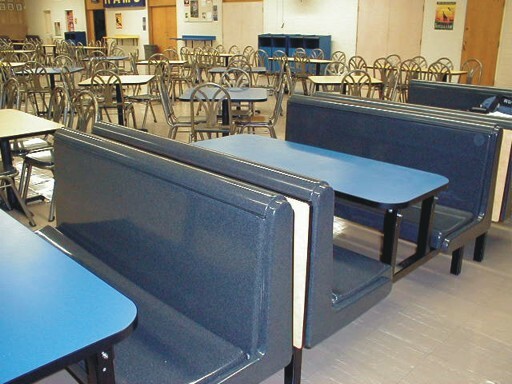 Fast food restaurant style booths on the room perimeter and movable pedestal tables in the middle for multi-purpose room use — all in school colors. Before: Don’t you see this as a large science lab? Well, so did the students - and they didn't come inside. After: Booths around the perimeter of the room, and moveable tables and chairs in the center now allow the room to be a multi-function area. Enclosed trash units — like at McDonalds™ — eliminate unsightly open trash cans.